Despite what you may have heard, nobody goes to a place solely because it has parking. In fact, the current obsession with parking is one of the biggest obstacles to achieving livable cities and towns, because it usually runs counter to what should be our paramount concern: creating places where people enjoy spending time. As long as the myth persists that economic prosperity depends on parking, local governments will continue to waste public money and distort the public planning process. The realization that creating a place where people want to come and spend time is more important than parking unfortunately eludes many municipalities. Worrying about and wasting public money on parking is taking over the public planning process and subsequently parking is taking over our communities. So how can we put parking in its place and draw people back to public spaces? Planting yourself in the street is a bold way to reclaim parking spaces, but there are more effective alternatives. One big step forward is to assess the supply of parking in relation to what is actually needed. PPS often works with towns that have excess parking capacity, where the growing number of surface lots and parking structures has choked out the very reason people drove there in the first place. In Salt Lake City, for instance, PPS's land-use map highlighted the excess parking spaces within 1/4 mile of downtown, showing that the real shortage was of places for people to go, not spaces to park. The hang-up on parking is an indicator that a community has no broader vision for itself. Is it a destination worth creating parking spaces for? Public dollars are often spent on large parking areas that provide no tax revenue and serve businesses that either compete with existing downtown businesses or would better serve the community if located downtown. But why should municipalities use public funds to subsidize parking spaces for destinations that don't enhance the community as a whole? Spending the same money to instead make development more attractive and connected to downtown means taxes better spent, space better used, and communities better served. Do the parking spaces really make more people want to go there? Think of the most popular district in your region - places like downtown Cambridge, MA, or the French Quarter of New Orleans. Is it easy to park there? No way! But do people go? You bet! 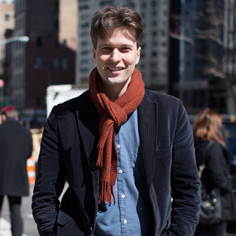 They'll walk six blocks from their car to a store, and LIKE it! Which is to say that people don't come to an area for the parking, they come for what's distinct and special about that place. Why should towns create excess parking spaces if all that asphalt detracts from the qualities that attracted people in the first place? Many communities that have parking shortages are actually thriving. This old piazza in the Italian city of Brechia has been given over to parking. It is probably no coincidence that the city center no longer attracts pedestrian activity and businesses. Are parking regulations being obeyed? When there appears to be a parking shortage, the most likely explanation is that people are simply not obeying parking laws. In the business district of Poughkeepsie, NY, PPS found that more than half the on-street parking was illegal. 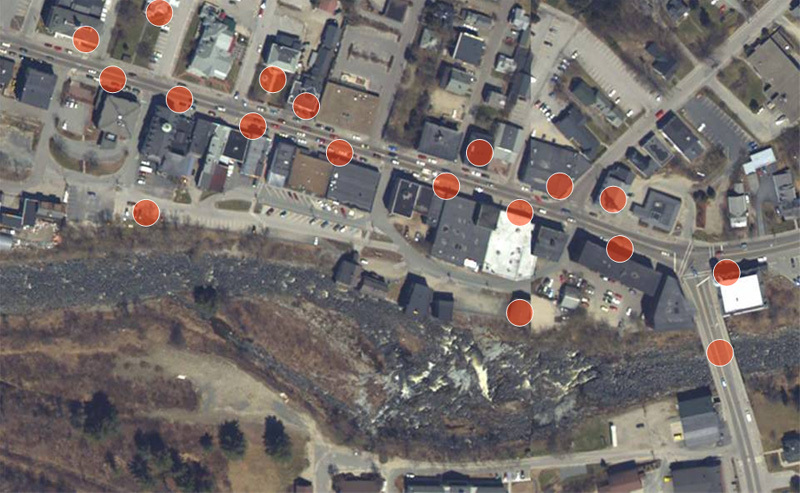 Parking turnover studies are an easy, inexpensive way to show where violations are happening and suggest how to enforce existing regulations more effectively. Are there opportunities to share business parking lots that have demands at different times of day or week? 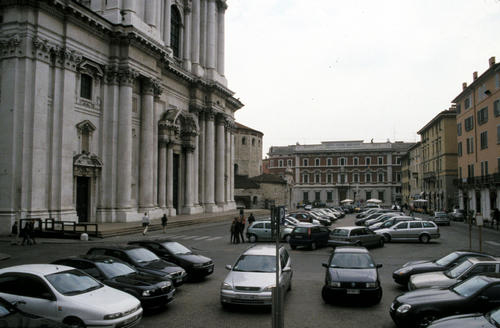 Parking areas for churches, theaters, restaurants and bars often sit vacant during peak hours, when demand is highest. Can these businesses and institutions be encouraged to let go of their dedicated parking areas and take advantage of existing nearby parking which is available on evenings and weekends? Put another way: Would people be more likely to go to church or the theater or a restaurant if they saw their destination as simply "downtown" and could easily visit more than one place per trip? 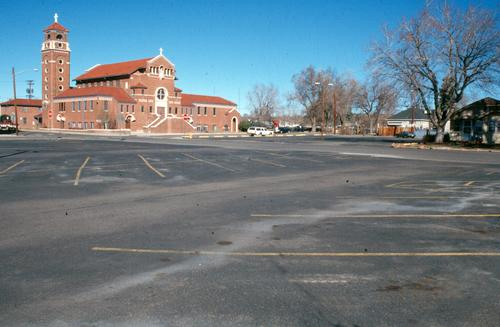 Parking lots for private institutions, like this church in downtown Arvada, Colorado, don't even get used most of the time. 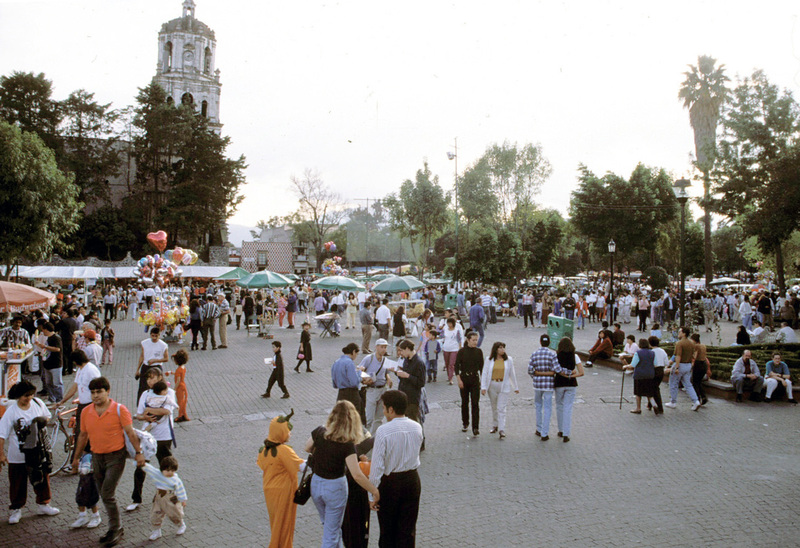 This Mexico City church is surrounded by active plazas that have recently reduced parking spaces to make way for vendors and markets. Where do employees park? If they have the same shifts, can they carpool? Merchants and their employees consistently take on-street spots early in the morning and feed the meters all day. They should be encouraged to instead park in municipal parking lots, carpool, or take transit. These alternatives can be made more attractive by designating off-street spots, creating employee incentive programs, or implementing shorter meter times. Is the timing and pricing of meters optimized for each location? Different sections of the same street may have varying parking needs. The meters in front of a post office, for instance, may provide two whole hours of parking time, but only require ten minutes. Some parking spaces should be more expensive to encourage high turnover. Again, parking turnover studies can inform more appropriate regulations that fit the context of the street. Are there adequate sidewalks and pedestrian amenities connecting off-street parking areas to downtown streets? The walk to downtown shopping areas from many municipal parking lots and garages is so abysmal that many people won't park there. Though such lots may provide significant quantities of parking, they will be underutilized if the walk from the car is poorly lit, dull, uncomfortable, or outright hazardous. Are there opportunities for angled parking? Lane widths in downtowns and on commercial streets need only be 8-10 feet, rather than the standard 12-plus feet. This means that many commercial streets are wide enough to accommodate angled parking in some sections. 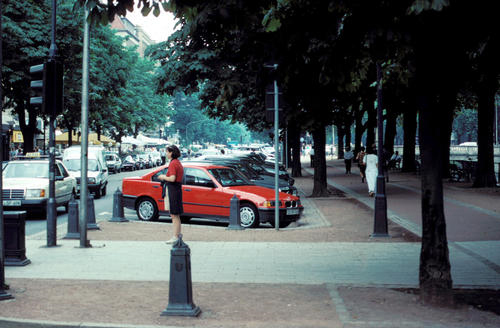 Angled parking can fit almost 50 percent more cars than parallel parking, and it calms traffic, creating a safer environment that's more conducive to pedestrian use. Angled parking--like on this street in San Bernardino, California--creates a more pedestrian-friendly environment than parallel parking. Can curb cuts be consolidated and narrowed? Frequently, parking lot entrances and exits can be combined, narrowed or made one-way to make room for more on-street parking and a safer, more pleasant pedestrian environment. Are there opportunities to share business drop-offs that have demands at different times of day? Some truck or passenger drop-off areas are only used for predictable early morning or weekday periods and can be used for parking the rest of the time. Once you start asking the right questions, ingenuity and cooperation will follow. In Littleton, New Hampshire, for example, PPS worked with the town to address its nagging parking problem by making downtown streets more walkable. Following a series of small, inexpensive traffic-calming experiments, the town is now partnering with several business owners to improve the pedestrian environment, reduce lane widths (and therefore automobile speeds), and expand the pedestrian-friendly downtown area. The improvements will increase the availability of parking spots from which people will feel comfortable walking to downtown by at least threefold. How? 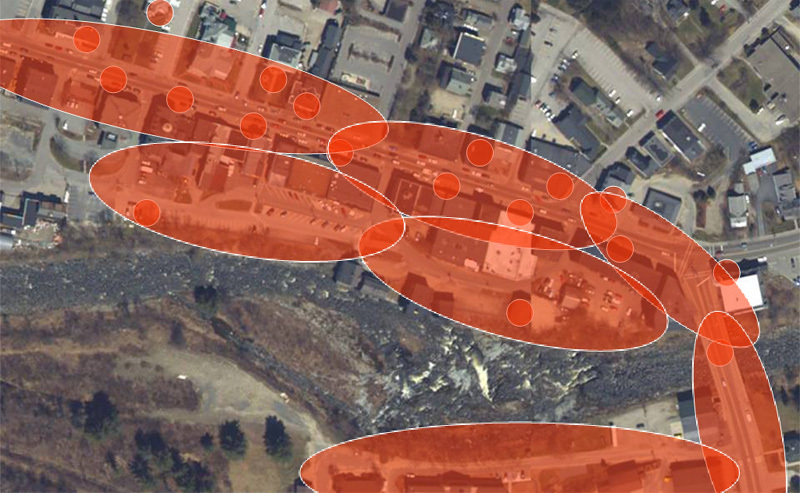 By enabling people to consolidate their car trips and visit more places from the same parking spot. Creating a more cohesive pedestrian district links destinations to each other, leading to more walking and less demand for parking. Pedestrian amenities: Street corners with more sidewalk space, seating, and plantings can become the focal points necessary to bring back pedestrians and streetlife. 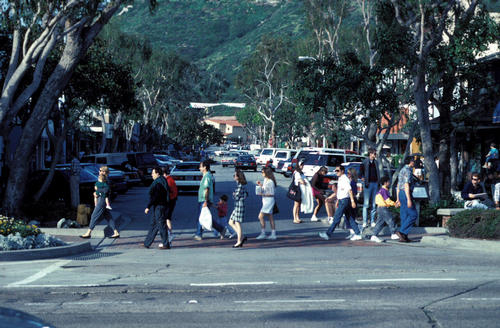 In Laguna Beach, California, expanded street corners and plantings create a better pedestrian environment. Improved safety: Curb extensions make sidewalks and pedestrians more visible to drivers. Narrower lanes slow vehicles and reduce risk to pedestrians and bicyclists. Replacing parking lots with in-fill development eliminates space that is perceived as unsafe and makes possible anonymous criminal behavior. Shorter crossing distances: Curb extensions at intersections create shorter crossing distances for pedestrians, and therefore shorter wait times for automobiles. Curb extensions improve safety and reduce crossing times. Retail kiosks and cafés: Temporary or permanent retail stalls can be placed at the street edge of parking lots or in reclaimed parking spaces. Programming and multiple-use spaces: Existing parking lots can be converted--whole or in part--into public squares with markets, performance spaces and seating areas. Transit compatibility: By reducing the supply of parking, demand for transit goes up and new destinations form around transit stops. Spending money on such public amenities instead of parking may seem radical, but in fact it is a wise investment. Pedestrians feel more comfortable walking because of the slower vehicle speeds and reduced number of curb cuts. Businesses get more passersby and first-time walk-ins. 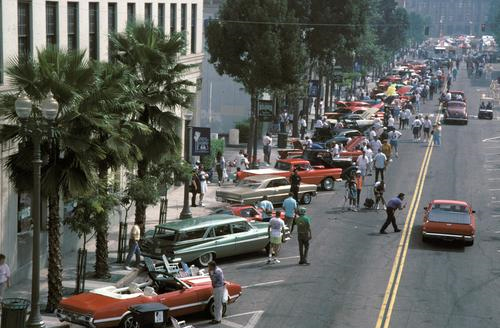 Drivers make fewer trips, waste less time in the car, get more exercise walking, and even enjoy the experience of driving downtown more -- because it is a pleasant place to be, not a parking lot. 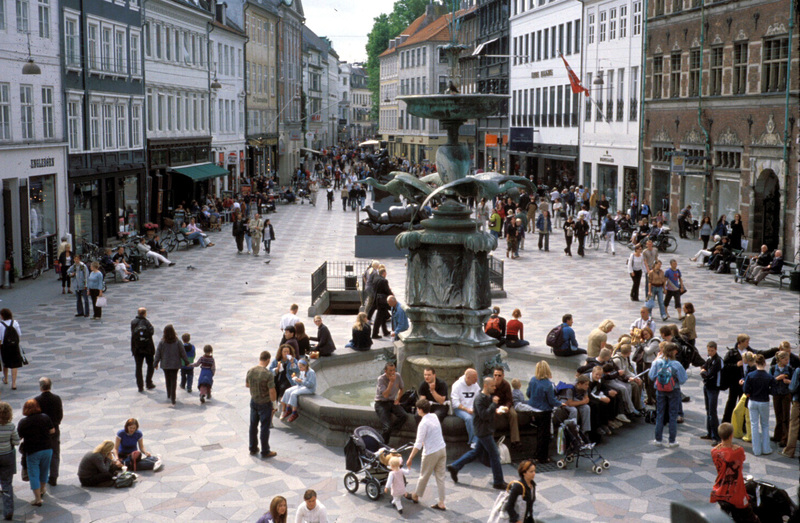 Consider the city of Copenhagen, which has instituted a policy to reduce parking by two percent each year. The risk has paid off many times over by the number of people who now walk and bike to the city center--all of whom, you can be sure, feel at least 50 percent more devotion for their home city. In the pedestrianized center of Copenhagen -- people everywhere and not a parking space in sight.